There’s a surreal scene this afternoon on the set of Robert Pattinson’s upcoming film, “Remember Me” as sirens wail just feet from where the heartthrob is rehearsing a scene. On an intersection in downtown Manhattan, the ever-present hordes of teenage fans are mingling with firefighters and the film crew — all less than 100 feet from a building that is dangerously close to falling down! According to eyewitnesses, a sensor set up to monitor a crack in a wall between two precarious-looking old buildings — apparently intended to provide an early warning if the crack starts to widen — has been set off. The alarm has brought five fire trucks and some 20 firefighters screeching onto the set to shore up the walls and get the situation under control. But while Robert Pattinson and company bravely soldier on amid the flashing lights of the emergency services, on-set sources admit the melee is a nightmare for the crew. “It’s causing a hold-up for the shoot. We can’t get anything in or out of here,” said one gaffer-tape wielding worker. Onlookers said that Robert himself is taking the most recent near-disaster to strike his movie, following last week’s near-miss with a taxi cab, in stride. But if, heaven forbid, the building were to fall down, the top would land a couple of feet from Rob’s dressing room trailer. 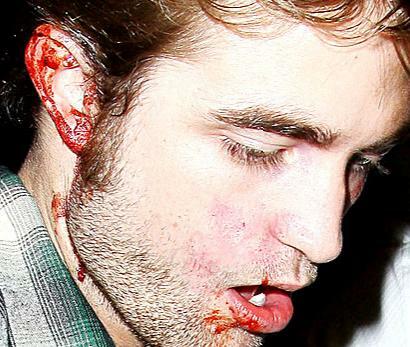 Meanwhile, Robert Pattinson was spotted as he is arrested with his face covered in blood while he films scenes for his new movie “Remember Me” in New York City, 6/23/09.